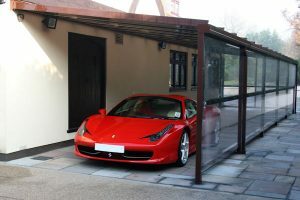 The Samson Aluminium Carport is a fantastic system that combines simplistic design with quality materials and minimalist aesthetics, and is available in three different styles. Carports can help protect vehicles such as cars and bikes from rain, snow, hail, falling leaves and bird droppings, keeping your car clean and protected. This can be a massive benefit in the winter when they stop ice and snow build up. 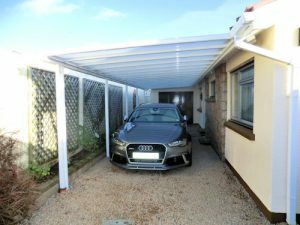 Whilst these systems are mostly used to protect cars, they can also be used as a fixed roof systems, and used to protect paths and areas underneath them. All systems are made from high quality aluminium with designs that combine ease of installation, simplistic design, and minimalist yet pleasing aesthetics. They are all manufactured and produced within the United Kingdom and with three different styles to choose from, you can be guaranteed to find one that suits you. 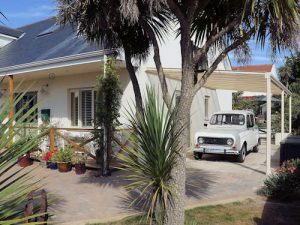 The different systems are the G6 Carport, the P16 Carport, and the P35 Carport. The main difference between these are the type of material used in the roof. Whilst the G6 uses glass, the P16 and P35 use polycarbonate, each of which have different benefits. Glass for the roof looks fantastic, and makes very little noise in the rain, however it is very heavy and this requires more supporting posts to handle the weight. Polycarbonate, meanwhile, is much lighter, allowing for less intrusive supporting posts. It can also come in both clear and opal, with UV absorber to protect the area below from the suns rays. The main downside however is that it can be noisy in the rain or hail. As the name suggests, the P35 contains 35mm thick panels for strength, whilst the P16 contains lighter 16mm panels to save weight. The P35 also has a large projection which makes it ideal for this use, and all three have unlimited potential length. The rainwater is directed towards the front of these systems, and into the gutters, before being directed down the inside of the legs to the ground. The frameworks can be finished in any RAL colour, including metallic, woodgrain and neon colours. All of these systems come with a full 10 year guarantee and a 25 year life expectancy.